EU governments have agreed to a batshit plan to increase the eurozone bailout fund to one trillion euro. That's a one and 12 zeroes - one million, million euro. George Osbourne says that the UK won't contribute directly to the bailout fund but then goes on to say that there is a case for giving the IMF more money which of course will go straight to the eurozone bailout fund and then there's the decision that private banks will be required to write off 50% of their Greek debts. Osbourne claims that UK banks aren't heavily exposed to Greece so having to write off half their Greek debt isn't a problem but this simply isn't true. UK banks have the fifth largest exposure by nation to Greek debt in Europe - €2.276bn. That means they will have to write off over €1.1bn of Greek debt, half of which will have to be written off by RBS which is itself more than half-owned by the taxpayer. So there's half a billion euro the taxpayer can wave goodbye to already, before a few hundred billion is thrown at the IMF. 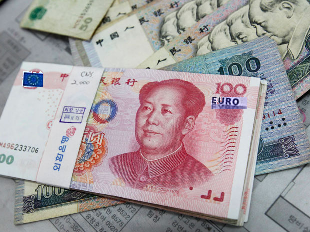 The EU is so desperate for money that their whole plan depends on China "investing" huge sums of money in the bailout fund - something that China is willing to do but on its own terms. The Chinese government says that it may well contribute to the bailout but it is likely to be through direct investment from Chinese firms rather than state investment in the bailout fund itself. This is the approach China has taken with developing nations, allowing Chinese companies to dominate local industries and hold their governments over a barrel. It also means effectively siding with the Chinese against the US, who are currently looking at passing a law to allow them to impose tariffs on Chinese goods in response to the Chinese government devaluing its currency to boost their export and domestic markets. Ironically, the Chinese government's policy of currency devaluation is exactly what Greece should be doing. Leaving the euro and re-establishing a weak Drachma would enable Greek companies to export goods cheaply which will bring in valuable foreign investment. It will also drive down imports because they'll be more expensive which will boost the domestic market, creating jobs and reducing the burden on the welfare state. But of course they can't do any of this because they've tied themselves into the €uro and are subjected to an economic policy designed to suit Germany and France. To make the expanded bailout fund work, there is going to be closer economic integration amongst eurozone members and non-eurozone members such as the UK will of course be sucked in. A new treaty will be required for the changes to take place and as with all EU treaties, extra power grabs will be tagged on which will have to be accepted by all member states. This should trigger a referendum through the useless "referendum lock" but no other treaty has so far and it's unlikely any future treaty will either because any EU-related referendum will result in the "wrong" answer.